With winter coming on and the fresh garden greens over for another year, I decided to sprout a few seeds. It will add nutrition to the store bought greens that I will at times be using. I ordered the organic seeds on-line from MUMM’S Sprouting Seeds. I ordered a kg bag so it will last us a while. In time I will order and try other seeds. I just finished making the second batch today and can hardly wait for lunch time when we will have it in our salad again. We plan to include some broccoli sprouts twice a day on days when we eat at home so I will be sprouting almost every week. On weeks when we are not home as often or are busy, I may sprout a larger batch and freeze some to thaw and use. 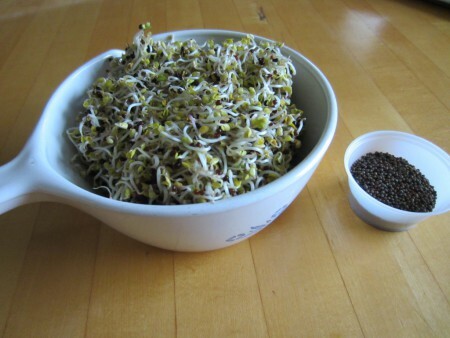 The first batch of sprouts I made were really good. I used a few tablespoons in every vegetable salad I made and in 3 days they were all gone. This time I used 2 1/2 tablespoons of seeds and it made a bit more. I will store them into a zip lock bag in the fridge for up to 5 days; if they last that long! The bag has directions on so sprouting is really easy. This is how I made this second batch with 2 1/2 tablespoons seeds. Soak the seeds in a wide mouth jar. Cover with mesh cloth (I used a clean square piece of nylon curtain fabric) and secure with a rubber band. Add pure water, swirl around and pour the water out through the mesh. Add 1 cup of cool water and soak for no more than 2 hours. Drain again. Invert & prop the jar to an angle so any excess water will drain out. I cover the jar with a towel but leave air space where the mouth of the jar is. Twice a day refill the jar with pure water and drain as before. For warmth, I put the jar in our south window and keep it dark with a towel. It has been cloudy and cool for a week now, but when the sun starts to shine, I want to remove the towel the last day too green the sprouts although I like them without greening as well. In a day or so you will see them start to sprout. Each time I added the pure water I swirled it around before draining. This allowed seeds that had not yet sprouted to mix with the sprouted ones and they too sprouted quicker. Once the sprouts were done & drained, I mixed them up and bagged them. The black shells that are attached are also healthy so when I use them I either chop everything up (especially if we are trying to hide them in a salad where children may be afraid to try something new.) or add them as is. I find the best way to introduce children to a new food is to allow them to help prepare. In this case it is great for them to help make the sprouts and then make the salad as well. I want to invite our grandchildren over to start a jar of sprouts; then sending them home with the instructions to finish them for the kids and their parents. This morning I mixed one of my favorite dressings. I will keep it in the fridge as it will be enough for many salads. I also use this dressing on my spinach salad. Mix the dressing ingredients together, adding the olive oil last. Shake well in a jar. Put in the fridge until time to use. Place the shredded kale into a bowl, add 1/2 teaspoon extra virgin olive oil and allow to rest for a half hour. Mix with the sprouts and onion. Shake the dressing and pour over as many tablespoons as needed.